For a limited time, SuperPro Client Management 5.0, will be offered for a special of only $399.99 for a limited time for this version! Click here to order now! 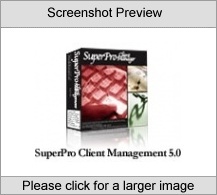 SuperPro Client Management 5.0 has been designed as a total solution for customer relationship management for business to people sales. A contact management system that allows for an unlimited number of clients, in one centralized location. Correspondence templates for pre-merged business letter, proposals, and estimates. Includes a label generator and the ability to fax or e-mail from within the program. The Customer Order Entry system is fully integrated into QuickBooks accounting software eliminating duplicate entries of information. Authorized agents can create weekly, monthly, and yearly spreadsheet commission reports. The Invoicing system can age statements in four categories and insert a reminder of initial terms of the sale. The Inventory Control System automatically updates and tracks sold products and quantities. It will also give replenishment reminders. The Sales and Product Analysis reviews the sales history to create a comprehensive report on both total sales and individual products showing sales and gross profit margins on a weekly, monthly, or yearly basis. The Asset Depreciation program can save hundreds of dollars on accounting fees. The progam will prduce your IRS forms #4562, Part 11 for current year and Part 111 for prior years and the IRS #4797, Part 1, Sale of Property form. The Appointment Setter is a daily calendar for appointments and important daily to do tasks. The appointment Setter comes pre-loaded with all major holidays and can be updated for your own special days or anniversaries. The Appointment Setter allows you to look at your appointments by the day or by the week. You can easily tab from month to month or year to year. Expense Report system allow you to review individual reports or year-to-date totals for an employee or for the entire company. SuperPros File Transfer System enables integration of flat CSV files into the software to produce relational functions within the program. Allows you to transfer new order, update contact notes and company information, send correspondences and expense reports. Will create new company records with contacts for new customers. Try the free trial version first, or click here for pricing/to purchase a full version! Order by phone, fax, cheque, money order, or order securely online!